Welcome to Pottery By Me & More! 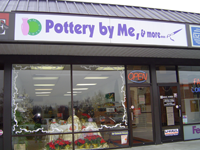 We are a "paint your own" pottery studio located in Hagerstown Maryland that carries an extensive and ever growing collection of fine unfinished bisque. Cups , Plates, Mugs, etc... just waiting for your personal artistic touch! Hand painted pottery is the perfect gift for Birthdays, Weddings, Mothers Day, Fathers Day, Christmas, etc... It's great fun for the whole family! Let us host your next birthday party! Children of ALL ages will have a great time painting their own special creation. Birthday parties are $16.50 per person. 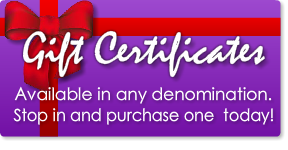 Gift certificates are also available in any denomination. Well first you vist our studio at 1201 E Dual Highway and select the piece(s) you'd like to paint. We will set up up with everything you need including paint, brushes and other tools to help you create your masterpiece. Once you've finished, we take it from there. We take care of glazing, firing and cleaning your works of art. Return to the studio after 7 days to pick up your piece(s). It's that easy! Please note that we recommend you to make reservations on weekends to ensure we can accommodate your visit.